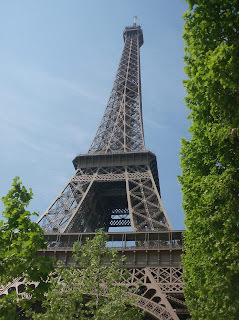 We spent the day around the Eiffel Tower, le Tour d'Eiffel, soaking up the sights, basking in the sun, cooling in the shade, and eventually going up into the tower (later posting). Around 1400 hours, we started to get hungry....our breakfast of coffee and croissants had long since dissipated! Mark stops to wash his hands and cool off a bit at this handy faucet before we go to a cool spot in the shade underneath the Eiffel Tower. Well, we start digging into the many wonderful treats we bought at the Farmer's Market this morning at la Rue Poncelet (previous posting)! Mark seems to think this is quite le Piece de Resistance! Those delectable cherry tomatoes spill out of our bags and explode in our mouths! Exquisite delights. And why not combine the cherries with the cheese and French bread? Pourqoi non? Then! There are the cold beets cooked in their skins that we bought this morning. It's such a fantastic idea to sell pre-cooked fresh beets in their skins for easy eating. Look at this! Well, let's see.....after eating a few bites we think about pairing this with the cheese...on some bread! Fantastique! Everyone in the Eiffel Tower seems to be looking down on us and drooling! Then, out comes the Comice pear...isn't this just gorgeous? Mark adds that it is tres bien and oh, so good! Then we pear it with the cheese and cooked beets...an unbelievable combination! Here's to Paris et le Tour d'Eiffel! Who says you can't have a delectable gourmet meal without cooking a thing? A father photographs his daughters holding their hands on top of the Eiffel Tower! We're wishing you the absolutely best weekend, from here in Paris!